Welcome to the first session of our exciting new interactive feature! Debate is an open arena where you can test your ideas with fellow Our World community members. Your thoughts are the whole point! By exchanging points of view, we move towards a better understanding of controversies on climate change, peak oil, food security and biodiversity. We all know that something has to be done about climate change, and most of us agree that we should all be part of the solution. But how many of us are willing to have climate change solutions right on our doorstep? Opposition by residents to nearby development proposals is referred to as NIMBYism, the acronym of Not In My Back Yard. One case in point was reported by Treehugger this week: North Carolina’s state senate has voted overwhelmingly (42-1) in favour of a ban on mountaintop wind turbines. Supposedly this came out of residents protesting the “ugliness” factor. This is a sad case of a good climate change solution being squashed by NIMBY-ish local residents? Or rather, as one Treehugger commentor suggests, does the vote count indicate that legislators are representing those with a vested interest in keeping wind energy away? And what about you? Can you imagine yourself falling into NIMBY syndrome under any circumstance (e.g., a turbine 2 blocks away)? Or if you’re a diehard anti-NIMBY, how do you think NIMBYism can be fought? Launching Debate 2.0: Not in My Backyard by Carol Smith is licensed under a Creative Commons Attribution-NonCommercial-ShareAlike 3.0 Unported License. Very interesting to hear about other more renewable-forward countries. Thanks all! I think that a big problem is the “traditional idea” of bringing your electricity from far away. Everybody should generate their own electricity at home! 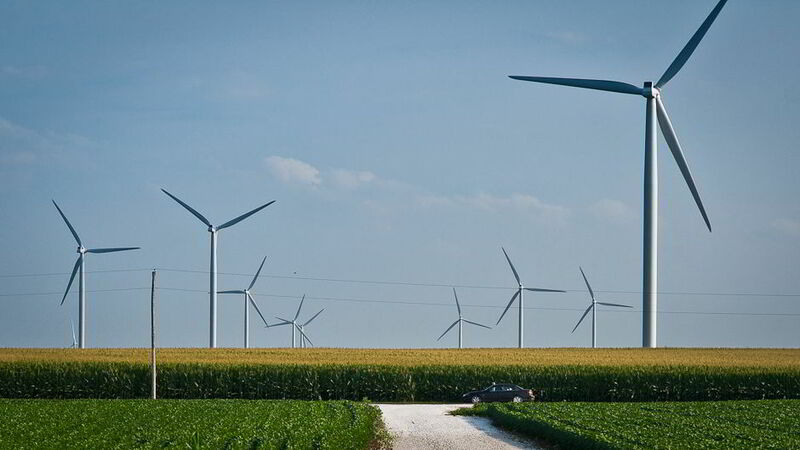 I live in Iowa, just 30 minutes away from fields full of wind turbines. I’ve certainly heard the arguments about “ugliness”, ruining the scenery, etc. I always reply with 2 things. 1) It’s Iowa. There’s no scenery to ruin. and 2) Wind Turbines are not ugly, but beautiful. A wonderful combination of nature and technology standing as modern monoliths, benefiting our world. However, when I recently drove through Oregon (I think), I saw these same wind turbines at the top of a nearby mountain ridge and I said to myself, “now THATS ugly!” There’s plenty of wind in Iowa. Leave the “good” scenery alone. IMO. “I would certainly not want one of these monstrosities anywhere near my property, nor do I want to see them blotting the landscape of the English countryside and waterways and causing grief and concern to local people in terms of noise and the blocking of sunlight. I notice that the former British Deputy PM John Prescott has taken a shot at Windy Nimbys in Bedford, England – the same bunch who were showcased in the Age of Stupid film. In fact he gave them the first ‘Age of Stupid’ award. Harder to find are current political leaders willing to lead their constituencies. I am proud to be from NC and proud to be a NIMBY. We are actually so well educated, that is frightens the people trying to railroad commercial wind plants on to our mountain ridges. That is why we care called names. It is not about the view, wind plants do nothing to help. They are a waste of tax payer money. A scam, a fraud. Nope…my mountains are not for sale. We can do more with conservation and energy efficiency than we can ever to with giant turbines. I do not want cement poured in to my mountains! GO NIMBYS as we are the protectors of the ridges!